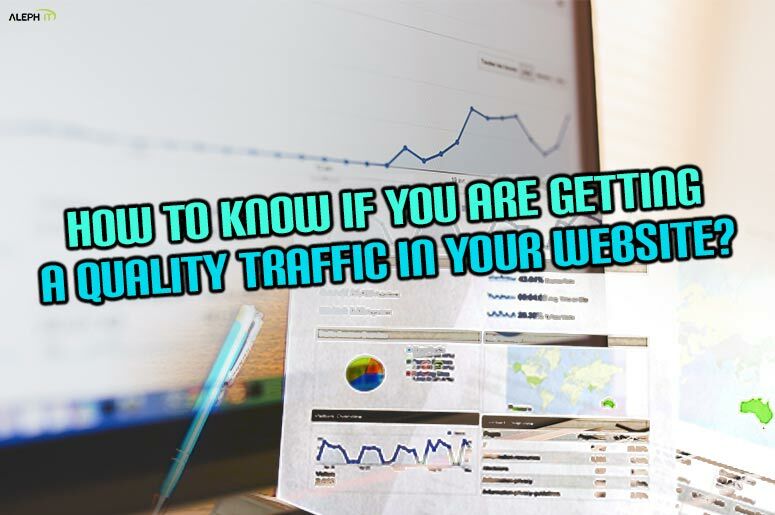 How to Know if You are Getting a Quality Traffic in your Website? In digital marketing, quality over quantity matters. In fact, 10,000 views in a day are good for some blogs, but then the real question is, are all these traffic legit? Quality traffic means that you are getting real people engaged to your website. It’s either they are buying a product or getting your service. And, in other words, quality traffic is the kind of traffic that you would want – the conversion. But then, have you been wondering how do you get quality traffic? And if you get it, how do you know? Now, if you want to figure out how to get high quality traffic, you need to think of some reason why it is not happening. Well, there are four common reasons why your website probably doesn’t get the result that you wish to have. But luckily, all of these reasons can be fixed! Considering that there are many handfuls of social media marketing platforms like Facebook, Instagram, Twitter, and etc. Moreover, your highest quality traffic is still likely to come through Google and other organic searches. If they search for a certain problem online, loads of results will come up. Sad but true, they’ll only bother on the first page of Google’s search results and the rest is a blur. In this case, people will only find you if your website is keyword optimised around a specific set of keywords. You can use a third-party site like Google’s keyword planner tool and others to help you with this. One of the biggest mistakes that most make around discussions of quality traffic is not monitoring its result regularly. Well, Google Analytics will let you do that! Hence, you need to set up goals in Google Analytics of what matters to your business. Whether that is sign-ups, time on page, cart purchases, etc. And once the goals are set, consistently monitor and compare the results. In this way, you can see which area of your website are most popular among users and what needs more improvement. Now, another strong analytics toolset is one that allows you to monitor user behaviour on the site. With this type of tools, you can see a user scroll through your site and where their mouse goes. This is helpful because you can think if your web design is very logical, but the user behaviour may appear confused. And if that’s the case, it might be time to move what they are actually looking for to an easier-to-find place. As mentioned, Google analytics is absolutely crucial in driving quality traffic. With Google Analytics, you can track conversions, tells you which traffic sources are converting the best, and let you slice your data so that you can go out and find higher kind of traffic. Now, after tracking, you need to make sure that you are doing your market research. Well, if you don’t know anything about your target customer, you are going to end up driving untargeted, low quality of traffic to your site that doesn’t convert. In that case, Quantcast gives you a demographic profile of your website so you can get a feel of what audience you should be targeting. The thing that really sets apart top tier internet marketers and the rest of the crowd is simple the split testing to increase conversion rates. It doesn’t only separate them from the crowd now, but keep their advantage for the years to come. And basically, Google website optimiser and visual website optimiser are split testing tools that allow you to test different versions of your site against each other simultaneously to determine which version generates a higher ROI. Yes, the higher your conversions rate, the more you can spend on traffic, the better you can compete. Google Webmaster Tools will give you an in-depth look into how your website is functioning. It shows you what your page load time is, broken links, and positioning of your keywords. Well, it is a useful tool to determine how well your SEO service effort is going, and it can also be used to optimise title and description tags. Rank Tracker allows the user to track organic search rankings for hundreds of keywords at a time. Putting keywords into the rank tracker will help you see what gets the best results. This type of tool will allow you to see your competitor’s backlink profiles. It also shows you the page rank of each backlink. Well, using this data, you can go out and essentially copy their backlink profile, and move up in the rankings and dominate your competitors. Above are some of the best tools that you can try to maximise your quality of traffic. Hence, there are plenty of other tools out there that you can use as well. What you just need to do is to make sure that your game plan works. After all, getting traffic to your website is never a problem. Hence, having quality ones are the starting point for just about every successful campaign. And when it comes to driving high quality traffic to your website, remember that there are no shortcuts. Improve your results by working with your brand recognition, improving your onpage and off page SEO, experimenting with a variety of paid campaign options, and fostering relationship and levels of engagement on social media. You can also have referral traffic by promoting your content to external sources. Moreover, be proactive and implement a comprehensive approach so you can win a higher quantity of quality traffic. This entry was posted in Digital Marketing and tagged Increase Traffic, Quality Traffic, traffic.